With the prices you pay at the hospital, you shouldn’t have to worry about asinine medical errors. Yet they abound. As quality medicine standard-bearer Johns Hopkins recently reported, medical errors are now the THIRD leading cause of death in the United States. The Johns Hopkins study was a follow-up to a similar report by the U.S. Centers for Disease Control (CDC). Startlingly, medical errors kill 250,000 people per year in the United States—trailing only (1) heart disease (614,000) and (2) cancer (591,000), and ahead of (4) stroke (133,103), (5) Alzheimer’s disease (94,000), (6) diabetes (76,000), (7) flu and pneumonia (55,000), (8) kidney failure (48,000), and (9) suicide (43,000). Not a good list to be near the top of, to say the least. 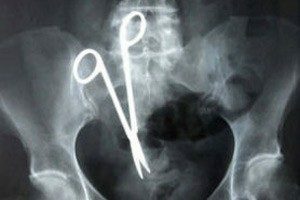 Perhaps the most avoidable of all medical negligence is the Unintended Retained Foreign Object (URFO)—a euphemism for “surgeon leaves [scalpel/sponge/forceps/clamp/scissors] in patient and sews her up.” A 2013 study found that hundreds of these events occur each year, many causing death. Ninety-five percent of UFROs resulted in additional care and/or an extended hospital stay. The total costs related to a UFRO is said to be $200,000 per incident. Thankfully, the legislature and courts have rightfully decided that URFOs are a “never event” in a hospital—an event that, if people are being reasonably careful, will never, ever happen. In that vein, under Florida law, “the discovery of the presence of a foreign body, such as a sponge, clamp, forceps, surgical needle, or other paraphernalia commonly used in surgical, examination, or diagnostic procedures, shall be prima facie evidence of negligence on the part of the health care provider.” Fla. Stat. § 766.102(b). “Prima facie evidence of negligence” means the jury will be instructed that the health care provider is negligent unless the health care provider produces evidence sufficient to rebut the presumption—arising due solely to the finding of a surgical tool inside a patient—that the health care provider was negligent. Leesfield Scolaro takes advantage of this statutory provisions whenever we can in order to level the playing field for our clients—and get them the most compensation possible in a case. We hope none of our readers become a statistic. But if your surgeon was asleep at the wheel and left behind a surgical tool that can lead to grave injuries, including damaged organs and death, give Leesfield Scolaro a call. We’ll help you navigate the complicated Florida law pre-suit process, so that you can concentrate on healing and getting on with your life.